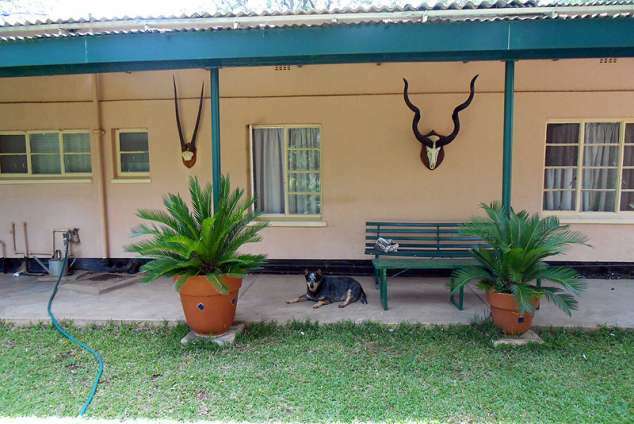 Palapye Hotel - Palapye Accommodation. We have 20 double rooms, seven of which are Motel type, with TV, Air conditioners and parking directly outside. Two of these accommodate residents who stay with us on a monthly basis. The other rooms are in the older part of the Hotel. All rooms have bathrooms or showers en suite, and those in the older part have been newly tiled. We have a busy public bar and Charlie's Arms Cocktail bar with its collection of historic old photographs of the area. Nearby attractions include Old Palapye with its Historic church ruins and graves, Moremi Gorge with its waterfall and pool, and Khama Rhino Sanctuary. 6880 page views since 31 May, 2013.